A man thrown backwards by the heartbreak goes in search of an artifact that could unsettle history. A woman carries her husband to a doctor in a suitcase. A Canadian senator begins a new life in a new country, in a company of a chimp called Odo. The book has 3 parts, Homeless, Homeward and Home. Three different stories that are connected to each other. Homeless is about a man who lost his son, wife and father in a span of one week and then set off to look for an artifact. Homeward is about a doctor who lost his wife, and about a wife who lost her son and husband. Homeward is about a Canadian senator who lost his wife, whose son is going through a divorce and who moved to the High Mountains of Portugal with a chimpanzee. Looking at my one-line summary of each of the stories, you may say that this book must be so painful to read as all the main characters lost their partners or children but I never felt one bit of pain while reading the stories. I am a sucker for painfully beautiful novels, the ones that make me cry buckets of tears but this one isn’t one of those. The first part started really slow. I honestly wanted to put the book down already. 90% of the story talked about how the main character learned how to drive a car. I read as quickly as I can because I was hoping that maybe by the time I reach the end of part 1, all this learning-how-to-drive-stuff will make sense but I really didn’t figure out what all the driving was about and its relevance to the artifact that the main character was looking for. Then came a woman, carrying her husband in a suitcase with a surprising ending. I loved this! The third part is ok as well; I just thought that the ending is quite predictable. Upon reading the summary at the back cover, I thought it is a painful novel but as I already mentioned, it isn’t. When buying books, I also consider the setting of the story. 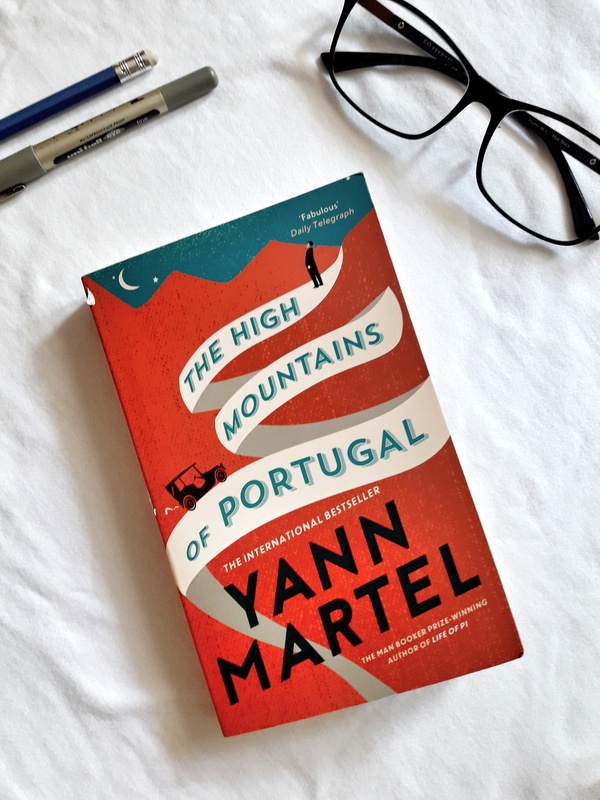 When I saw the title, High Mountains of Portugal, I was so excited because I haven’t read any novel written by a Portuguese author or at least with Portuguese setting. However, this part was a let down for me. I felt that it lack that Portuguese touch on it. There are mentions of the streets and the names of the characters are in Portuguese and some lines on the 3rd part of the story where in Portuguese but other than that, I didn’t see anything Portuguese in this book. I expected to learn some bits and pieces of the culture but I didn’t. The story felt like it happened anywhere. The story sounded more English to me than Portuguese. Before starting to read this book, I looked at the ‘praises’ at the back cover. I saw a line saying something like, “Yann Martel’s best after Life of Pi.” I almost fainted after seeing that. I didn’t like Life of Pi because I almost died of boredom while reading it. I can’t even remember if I finished reading it. All I can remember is it’s very boring. Then I thought why didn’t I notice it? If I had, I wouldn’t have bought this book. So even before reading this book, I already have negative sentiments towards it but I told myself to still read it because maybe, just maybe this book is different from Life of Pi though I already expected it to be boring and the first part of the book exceeded my expectations (LOL). So, would I recommend this book? If you’ve read Life of Pi and you liked it, and then please take the pleasure of reading this book. If you have patience in reading slow paced books, then go ahead but if not, don’t even bother. Kapag natatamad ako sa isang book, binibilisan ko rin magbasa! Hahahaha! “Naku ang tagal naman ng magandang part..” ganyan haha. Aysa! Boring ba talaga?? Parang gusto kong subukan kasi interesado ako sa Portuguese lit, although medyo hindi yata ito swak batay na rin sa ulat mo. Super boring nung part one. OK yung part 2 and 3 nung book kaso hindi ko talaga maimagine ang itsura ng Portugal kaya kung Portuguese Lit ang hanap mo, hindi siguro ito ang tamang libro. i didn’t like the pace of Life of Pi, as well. so i might be skipping this book for now. thanks for this review, it would save me from picking this book during my next book shopping! Kapag sobrang slow-paced ‘yung book, inaabot talaga ako ng buwan bago matapos. Hindi ako nagsstart ng new book talaga kahit na andyan lang siya nag-p-pssst sa’kin kasi ‘di ko pa nga tapos ‘yung isang book. Huhu. Boring pala ‘yung life of Pi? Interested pa naman akong basahin kasi parang ang ganda nung movie. Well-written review. I hope you find time to read the book I’m writing in my blog. I’d love to get feedback from someone so observant. It helps me improve the way I tell the story.